Working Title: Dark Comedy and Skeletons! This week Will Leschber takes a walk on the dark side of comedy. As you may have noticed, here at Theater Pub, September is a month of comedy! Looking for live comedy? Check out great suggestions by Allison Page. But if you are looking for something a little on the darker side of comedy, read on. 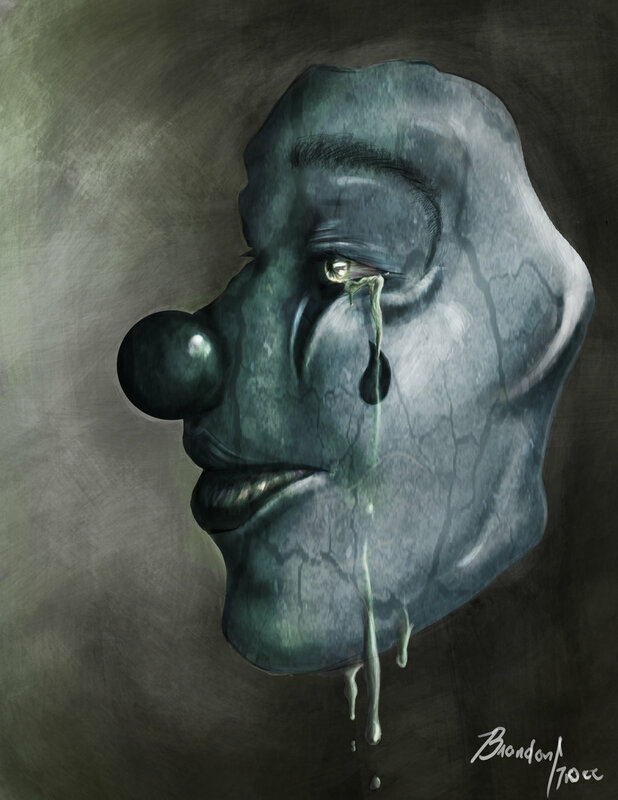 Sad clowns are my favorite. It’s possibly more accurate to say that there’s something about the sad clown juxtaposition that has a greater draw and hits closer to home. The sound of sad clowns and dark comedy seems to me a resonating indigo bell. Maybe it comes down to the fusion of two spectrums of theater, or life in general for that matter. Comedy, tragedy, light and dark all at once. That is closer to my experience. We get everything all at once and have to juggle the mirth and the struggle simultaneously. Laughing around a hospital bed as you share old stories about a fading friend. Celebrating an anniversary while a close friend disintegrates towards divorce. Proudly graduating and then being forced to recon with uncertain futures. Moving away from home. Leaving a secure, steady job that you hate. Marveling at a beautiful sunset with no one to share it with. Experience is layered. Great comedy deals with bigger things than just getting a laugh. 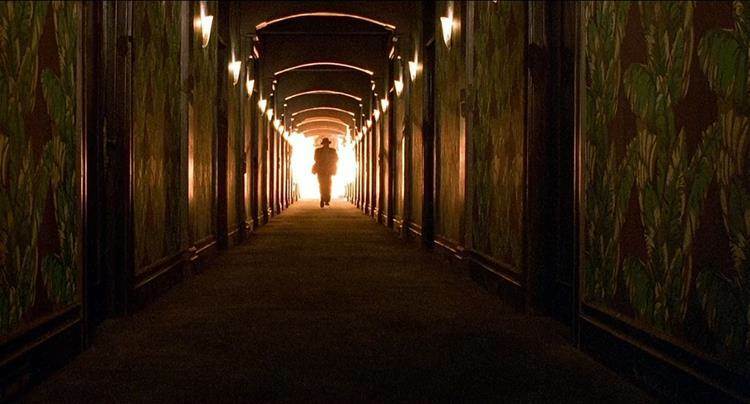 The best dark comedies may have an easier time straddling line because we give them room to grow beyond the mere joke. Fight Club, Fargo, Barton Fink, In Bruges, Fear and Loathing In Las Vegas, Death to Smoochy, American Psycho… All these films are concerned with a layer of topics and still remain brazenly funny. They wrestle with Identity, finding your place in the world, materialism, the cost of creativity, definitions of success, commercialism, the meaning of repentance and also unconventional humor. One of the best dark comedies of 2014 is in theaters now. 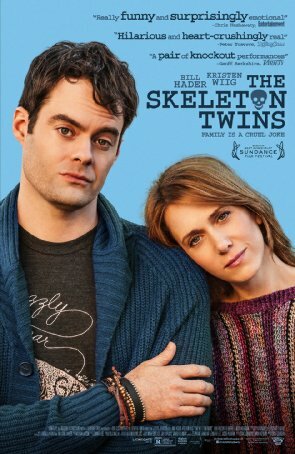 The Skeleton Twins stars Kristen Wiig and Bill Hader as troubled siblings who reconnect after a ten-year estrangement when one of them attempts suicide. Sounds dark, right? Well, it is. Darker than I expected after hearing the buzz and seeing the trailer. But the film also contains some of the funniest scenes of the year. I laughed so hard and so long at a sequence in which Hader’s character Milo attempts to cheer up his sister by lip-syncing Starship’s “Nothing’s Gonna Stop Us Now.” It may be the funniest 5 minutes of film this year. This is bookended with the lives of these characters falling apart. It’s a marvel of balancing tone. Moreover, the two lead performers are the what allow this film to elevate to a higher level. We seen comedic actors given the chance to do dramatic work before and when its done as well as this you should pay attention.